The kitchen may be the heart of your home, but don’t underestimate the importance of your bathrooms. If you think about it, bathrooms are one of the most frequented spaces in the home. It’s where you go to rejuvenate and get ready for the day. It’s the place where you take the time to make yourself look and feel your best. A thoughtfully designed bathroom can start your day on a positive note and end it in a calm, relaxing and stress-free manner. With this in mind, good design becomes essential. A well-designed bathroom has many elements that come together in a cohesive fashion. The space should not only reflect your personal aesthetic but also adapt to your needs by streamlining your day-to-day routine. 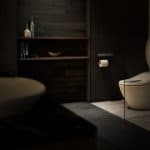 Finding a balance between fashion and function might seem challenging, but when you look to customization that incorporates technology, you’ll quickly see that creating a bathroom of your dreams is easily within reach. Whether you have a standard bathroom layout or a tricky design with boxed-in constraints, modular configurations are a simple solution. When you choose configurable products from companies like Robern, you’ll be able to select from a wide array of sizes, shapes, and options to fit your construction needs. That means you can design an amazing bathroom experience in the tiny powder room outside the den as well as the large master bathroom suite. Thoughtful design and complete customization can help you maximize any potentially awkward space. Even the most exquisite bathroom can become a source of frustration if the counters are cluttered or styling tools are hard to reach. Configurable solutions — like modular vanities and multiple medicine cabinets creatively ganged — let you design a storage solution that fits your lifestyle. Robern engineers put cutting-edge technology into each product to simplify the bathroom styling process. 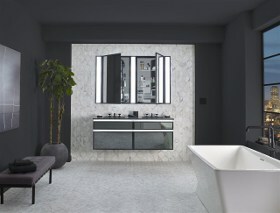 For example, vanities feature electronic outlets for modern styling tools, strategic lighting for easy all-day use and magnetic strips for simplified storage. Lighting is a fundamental part of bathroom design and highly influential to enhance your routine. While lighting can perfectly illuminate the bathroom, it doesn’t necessarily mean it does a good job of illuminating the face. Top lighting — common in bathroom design — casts shadows on the face, which is bad for makeup application, shaving, and other personal hygiene tasks. 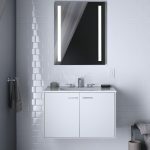 Consider lighted mirrors from Robern, designed to strike the face from at least two directions, providing even illumination and minimal shadows. 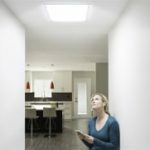 No matter what illumination you choose, keep in mind that lighting from all sides with adjustable features will increase functionality. There is a multitude of choices that allow you to create a personalized and custom bathroom experience. For the shower, consider a variety of showerheads, raindomes, wands and ceiling shower tiles that elevate the ordinary to the extraordinary. Wall-hung toilets can be a subtle interior design statement that not only adds a cosmopolitan flair but also makes cleaning a breeze. For faucets, gooseneck or low-spout faucet designs are currently trending. 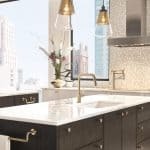 To instantly boost the faucet luxury factor, plumbing brands such as KALLISTA offer an array of handles that can be selected with decorative elements including semi-precious stones and marble or onyx inserts. The bathroom floor is often overlooked as an opportunity to inject your own personal style with custom elements. Prefer warm and cozy? Minimalist and modern? Whatever vision you have in mind for your bathroom design, tile is always on trend due to its high performing functionality and variety of colors, patterns, and textures. ANN SACKS offers an abundance of choices, from custom colors that can be created on demand to faux finishes that look nearly identical to the real deal (think porcelain tile that looks like wood). Add heated elements during installation to further enhance your bathroom experience. With smart bathroom design, fashion and function can blend together for the ultimate in customization. To learn more, visit www.robern.com.